Digital Rights Management, known as DRM to my people, is a pain in our content because of the Digital Millennium Copyright Act of 1998. This law says that if an effort has been made to protect content from reproduction through encryption, and that method is broken then you can be held liable for breaking the protection. It also slowed the adoption of FireWire as a transmission path for DVD and High Definition until it could be protected during transit between a playback device and a display. DVI got us started, but the High-Definition Multi-media Interface or HDMI does all which FireWire does with the inclusion of High-bandwidth Digital Content Protection or HDCP. Did you get all of that? Without acronyms I would not have a job. Basically HDMI is encrypted FireWire and you cannot "capture" and reassemble packets in motion as they go between devices without a secure encrypted handshake. All that being said, I find it odd that Sony, owner of many labels, production companies and media production facilities has begun shipping their latest product to aid in mass-theft, I mean ripping of digital media. 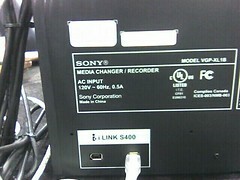 The Sony VGP-XL1B 200 CD/DVD/Dual Layer Burner has a FireWire/iLink port to tie into their matching Media Center PC. The Windows XP MCE 2005 Roll-up has new features to let this 200 disc changer literally rip through a majority of your CD collection and digitize them on your hard drive in a single sitting. The dual-layer DVD burner within will copy those tracks back to discs or write your recorded low-definition captured television to a DVD. An empty PCI slot inside will hold an HD tuner which you can record and also burn to DVD (albeit in a low definition, yet clear version) now. Finally, it will use your Internet connection to grab the artwork from up to 200 of your store bought DVD's that you place inside and let you choose a movie by selecting a picture from the assortment displayed within the Media Center Interface. Two features are missing in my opinion, due to DRM, which may be able to be "patched" with a program like DVD43 or AnyDVD. You cannot play your DVD's through Media Center Extender devices and thanks to Content-Scrambling System or CSS you cannot rip your DVDs to the hard drive. Now at an average of 6GB per DVD, ripping movies would take 100 times more space than ripping an audio CD. But that is using MPEG2; DivX or MPEG4 would take much less space and make the content much more portable. I think that you should be able to put the movies that you buy on any device or television around your house. I have all of my music CDs encoded into MP3 and they can be played in any room in my house. My whole house audio system is my most used gadget in my life. Video, however stays on DVDs in a shelf until I get up, choose, and insert them into one of a half-dozen players in my home. I wish that it was digitized like my music was. I want my DVDs to be seen anywhere. Throw a watermark in the video to track the serial number of the device that encoded it and make the people who do bad things pay for their crimes of distribution. If I want to make a copy for my own fair use on another device I own, like the Sony PSP then let me! As I close this, did you notice anything unique about the photo above? The DVD player only has a single connection, even better, it is a high quality digital port. A port that pushes video and audio in the clear, FireWire. That's right, no encryption means that we may soon see FireWire CSS strippers just like devices that would remove Macrovision from composite signals to allow you to make VHS copies of your video tapes or DVDs. If this 200 disc changer is the hackers dream, sign me up for the 400 disc version. I have some fair use to get to.